The mission of Buchanan Elementary is for highly qualified teachers to challenge every student to reach his or her full potential through the the use of best practices. These items are not included on our school supply list but are so helpful during the school year. Students are not required to buy these, but can volunteer to purchase these if they choose. Look for the practice tests related to technology enhanced items. The username and PW are located on the login page. Individual student logins are not needed. Click here for Faculty and Staff email addresses. The mission of Haralson County Schools is to produce high-achieving students who will graduate and become productive and responsible citizens. 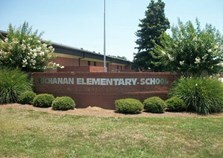 Buchanan Elementary (BES) will accomplish this mission by setting goals in our school improvement plan and monitoring student progress throughout the school year while encouraging student social development. During the 2017-2018 school year, Buchanan Elementary plans to strive for continued improvement, celebrate our many successes and reinvigorate Rebel traditions as we embrace the ever-changing future.